Three hundred and fifty four were built between 1889 and 1898, making them a common sight on LNWR trains. Four and six wheel coaches were once a commonplace sight ,with all of the pre-1922 companies using them, many transferring through for use by the 'Big Four' and a number even continuing in service post-1948 into British Railways days. In those final days of use however, those that were left earning their keep were inevitably confined to either extremely secondary branchlines or used in Engineers' or Miners' trains [locally much photographed in the Glyncorrwg area for example]. The prototype coaches in this build were originally constructed by the London and North Western Railway, then absorbed into the London, Midland and Scottish Railway at the first Grouping and passing their remaining days on secondary and suburban routes until their scrapping [although some survived for a while in BR Departmental use]. In 'OO', ready-to-run models of these short coaches have always been outnumbered by bogie models: Exley made some four and six-wheelers in different 'Big Four' liveries and Hornby Dublo made their well known tin-plate 'Stove', the LMS Full Brake. A 'Stove' has since also been released by Dapol. Hornby of course continues to manufacture a generic and toy-like four wheel coach and Ratio continues to produce three different GWR four-wheelers as plastic kits but apart from this, unless you make a foray into etched-brass kits, that's all that there is. I recently acquired three Keyser white-metal kits of these L&NWR coaches. I had been trying to get some for the best part of a decade but they are the scarcest of the Keyser coach kits, do not arise that frequently on eBay and when they do, they can be unrealistically expensive. I was extremely fortunate to be given some however, an exceptionally generous gesture which simply required in return a donation to a charity of my choice. Later releases of the kits [the ones I'm building are earlier ones dating from the late '50s] frequently suffer from worn moulds and their castings often show considerable distortion. The photo below [click on it] shows what I mean. The price on the card [19/10] dates it from the mid-60's and I bit the bullet on this eBay sale paying £23 for it. The body sides show both bad distortion at the ends and also on the chassis frames. In both cases this will be extremely difficult to resolve. In fact a recent attempt to straighten the frames and clean out the flashing/webbing around the springs resulted in everything just falling apart, the metal being too weak. I cut the frames away entirely and will use a Ratio four-wheel chassis to rebuild it at some time in the future. These models look simple: they can be extremely challenging however, in spite of their limited number of parts. And getting the 'chassis' to sit squarely and run true is another matter altogether! My kits, each of the three different models introduced by Keyser in the late '50s at 18/- each, arrived partly assembled and although bent, battered and partially primed, complete. Steeping them in caustic soda for half an hour removed both glue and undercoat and allowed easy dismantling. The castings were very good and hardly any fettling was needed to restore their shape. A little dressing with a file was all that was required. The photos below show [on the left] the sort of condition that the three arrived in [really quite good after the sides were bent back into shape] and [on the right] what they looked like, typically, after dismantling and cleaning. The left-hand photo is an All Third and the right a Full Passenger Brake [click to enlarge] . There is also a Brake Third in the series. The Full Brake has had the guard cut away from one side as Keyser moulded him looking out of both windows simultaneously! The presence of the guard, a novel feature at the time, was a significant feature in the advertising of this coach when first released. 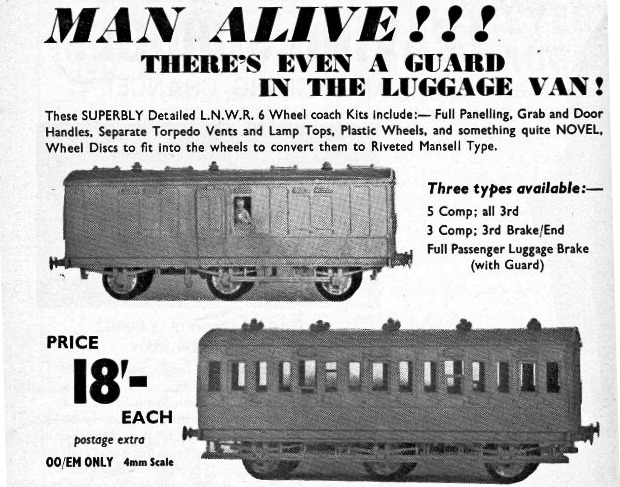 The screenshot below is taken from an early 1958 copy of Model Railway News [remember that anyone?]. So, the first build will be the attractive Full Brake. It, like the others, will run in a slightly stylised late-30's LMS livery. The problem of liverying these coaches lies in the relative scarcity of the models themselves: there are almost no photographs at all of them on line just one or two in LNWR livery and that’s it. Whilst some of these 6 wheelers survived in use in the ‘40s [95 were still in use in 1933 and the last of these ran until 1952 in fact], they would only have seen use on secondary services or been relegated to departmental or engineers’ trains and so were unlikely to have been repainted at any time during the previous 20 years. The livery I’m using is thus somewhat speculative and based on an assumption that some were still earning revenue on branch or unimportant suburban lines. The photo shows one of the sides given a test paint and lining. The paint is Rover Damask Red [Halfords rattle-can] and the lining is by Pressfix. This is a test livery only. I may also decide to line with a bow pen as it is easier than stringing out fine, fragile lining in a straight line [even though it looks reasonable ]. The word 'Guard' has also since been removed as it was incorrectly applied. Do please excuse the seemingly ever-present dust, fortunately it is on and not in the paint! With both sides now painted and lined out, and awaiting a floor to be made and eventual masking-up for the solebars and chassis to be sprayed black, the coach ends were cleaned up and sprayed matt black. These four parts have been put aside for the paint and decals to cure fully before further painting and varnishing takes place. So much in kit building is about problem solving. I had not intended touching the roof of the Brake for a while but the issue of glazing just niggled away. Finishing the model was never going to be dependant on glazing the sky-lights, but every attempt had to be made to at least try to glaze them neatly as they are such a visible feature and gaping empty holes would just look awful [see the earlier photo]. Before commencing glazing however, I primed the roof and then sprayed it with Halford's Matt Black, then masking up the top to spray below the rain strips with Grey Primer again. Glazing from underneath was not an option as the 'glass' would lie at least 2mm below the top of the roof. I tried flush-glazing, cutting inserts to fit within the frame, but was defeated by the different sizes of each of the four frames and no idea as to how to glue them in anyway. But then I realised that the openings could quite effectively be flush-glazed from above. This was the easiest option and four pieces of shirt-box type thin perspex were cut, bent in half at about 30 degrees and then finally trimmed to fit the upper openings. Each was then glued into place using Johnson's 'Klear' and allowed to dry before a frame was drawn around each one, in matt black paint, with a bow pen. A reasonable job I think. A little further progress to show. The sides have been painted and lettered, and varnished, although the solebars and chassis will not be sprayed black until the body has been assembled around the yet-to-be measured and cut floor. The closed Guard's window has been glazed and the Guard painted, too. He was a difficult one to do as the depth of the moulding was quite shallow and so his surface detail was rather flat. Consequently, he looks far better in OO from two or three feet than he does in the enlarged photo!! The wheels have also been painted, after giving two axles pinpoints and removing the flanges from the third. A floor has now been cut out of a dense foam-board type material and one side and the two ends of the coach attached to it. Brass top-hat bearings were adapted for the axle boxes and super glued in. A dry run with the wheels inserted and the second side held on with a rubber band showed square and free running. Did I say earlier that simple though these kits appear to be, they can never be taken for granted however? The last few days have been beset with self-inflicted problems: a classic case of more haste, less speed. I managed to smear epoxy resin over one side and both ends for starters. Don't ask me how, I just did. Fortunately it was the varnished side that was messed up and several very quick and light passes with a tissue soaked in IPA solved the problem. The ends were treated similarly and survived, although they will be resprayed. Attaching the second side and inserting the wheel sets led me to believe that there would be no further problems. The body is square and sound but a trial run on track, once the adhesive had dried, showed an appalling wobble, something I could not live with. This had not surfaced at all during the earlier dry run and was a puzzle until it was traced to one of the wheel's plastic insulating bushes. The wheels are at least 50 years old and at some time, during their attachment to the coach, a bush had cracked and the wheel had shifted out of true, irreparably so. Pop rivets are available in a number of sizes and provide a valuable source of cheap metal tubing for jobs similar to this. Finally, a photo with the roof dry-fitted to check for squareness, etc. I have repainted the roof and it awaits re-application of grey paint below the rain strips. Buffers and couplings have also to be fitted and a little touching-up applied here and there. But coach one is now nearly complete. The glazing of the roof lights is quite effective I think, certainly worth the effort. Final work undertaken to complete the first of these three coach builds involved adding vacuum pipes, dummy coupling hooks and a Bachmann coupling at one end of the van. The photos below show it in its finished condition. It has since been fitted with a running lamp at the rear. The second coach in this set of three was next and it has now been finished. The Brake Third was built in the same way as the coach above although it presented more difficulty as the sides were not whole symmetrical. This caused problems when fitting the wheel-sets and also the roof, but all came together in the end. This coach runs grumpily through slips and some point-work although I think that is just a back-to-back problem which will be addressed in due course. It's an attractive vehicle with duckets and rear-facing windows and pairs well with the Passenger Luggage Van.